I returned to Alaska a few weeks ago, everything muddy and brown, the trees bare of leaves, last year’s trash blowing across the streets. I was used to the sun-filled warmth of Tucson, to hot days and balmy nights, to sitting out in the yard and reading and then running late afternoons in just shorts and a tank. Suddenly, I was bundled up in a puffy down jacket and mittens. I wish I could say that I transitioned gracefully, but I didn’t. The first week back it rained almost every day. Gray and gloomy skies, and not a hint of sunshine. Seriously sat there, looking anxiously back and forth at our faces. Poor Seriously, poor sad and needy and overly affectionate Seriously, who loves me too much, whose love I don’t always deserve, Seriously looking at me with her sad and soulful dog eyes and I swear, something inside of me just broke. “Okay, I’ll stay but I won’t write,” I said. The next day I received notification that my essay “Eating” had won the Women’s National Book Association’s nonfiction prize. The piece is about dressing my sister’s body after she died of an eating disorder, years ago. It’s formulated in short segments, in bare-bones prose. The experience was both ghastly and yet beautiful, and the essay hopefully reads much the same way. Okay, enough about the meaning of life and living and writing, blah, blah, blah. 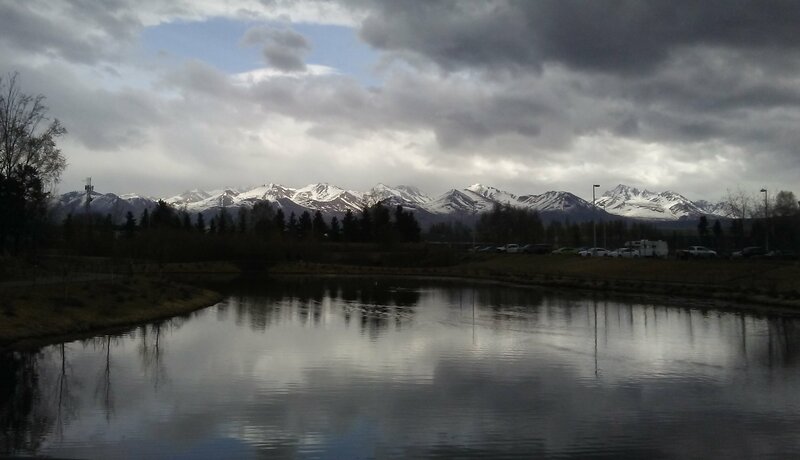 Here are some scenes from Alaska. 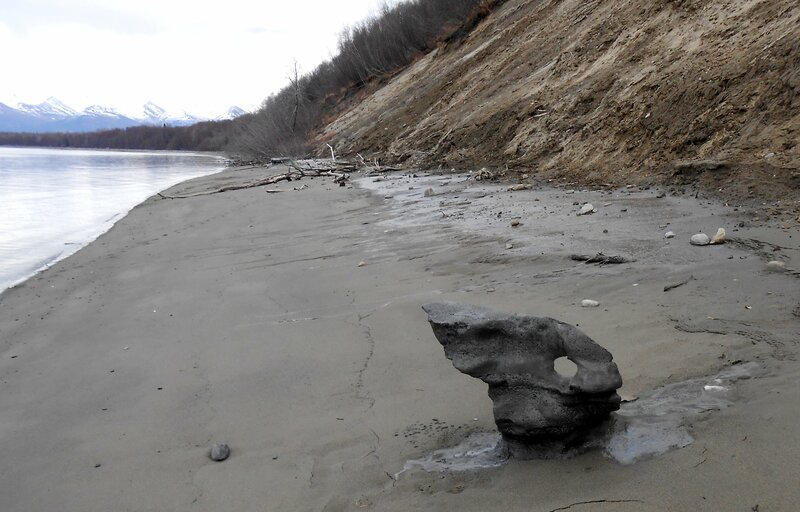 Iceberg melting along the beach. Walking the dog in the park during a rare period of sunshine. Running through the birch trees on one of my favorite trails. Running through the moody ferns and spruce trees. Walking the dog in the midtown park. Seriously playing with another dog at the dog park. 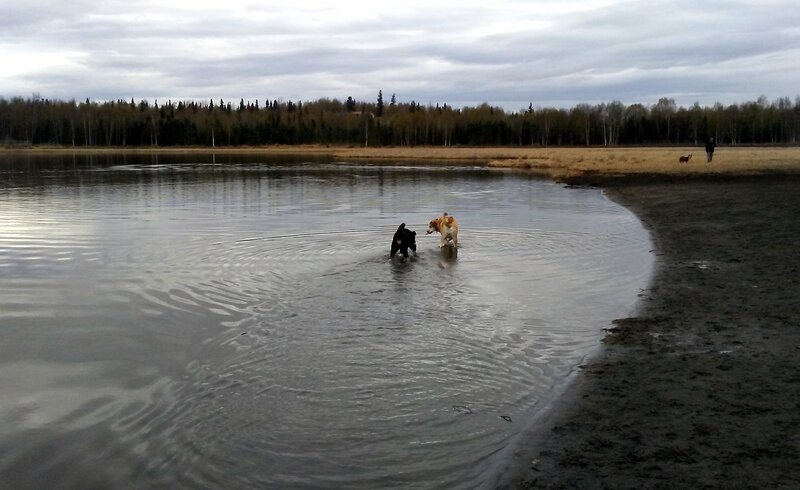 Here in Anchorage, we have vast spaces reserved for dog parks, with lakes and acres of hiking trails. This whole lake is just for dogs, cool, eh? 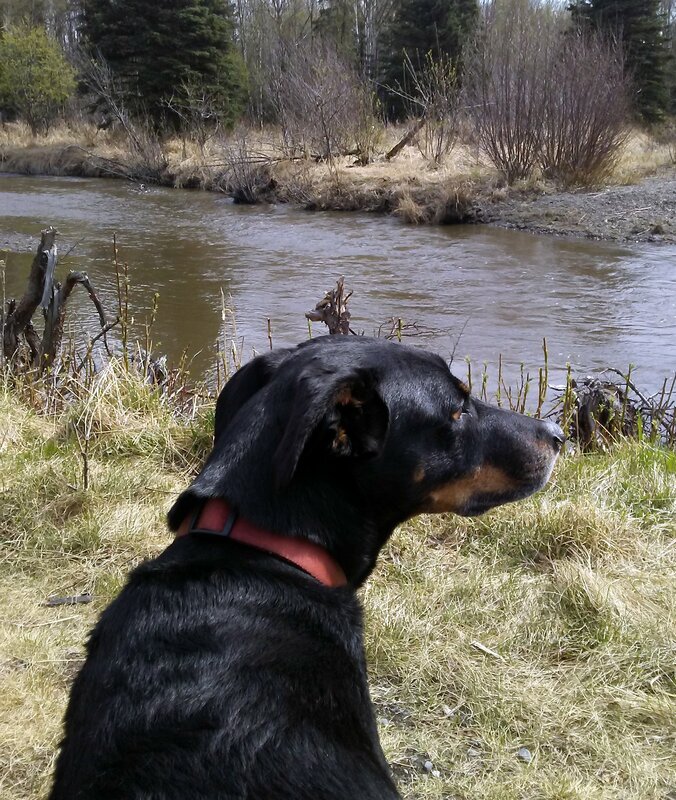 Seriously, contemplating the meaning of life during a rare sunny interlude along Campbell Creek last week. Congrats on the award for your essay. It sounds like an incredible read. And I’m glad to hear you’re getting out of your funk. Hope some good writing is coming your way now. Thanks, Mark. I was in a huge funk after returning to Alaska. It’s beautiful here and I love it but man, the lack of sunshine and the consistent and cloudy skies can bring me down, fast. Which is why I run so much, to keep all the chemicals in my brain happy and calm. How is your writing going? Will have to hop on over to your blog. I was without internet for a month, no TV or internet, just the radio. Was so nice. I read a lot of books and actually (gasp!) talked with my partner face-to-face, instead of over screens and between screens and talking while secretly reading/looking at a screen. Cheers and have a great week. A month without the internet or TV … is that like heaven on Earth or what? Congratulations, Cinthia!! You rock even when you don’t think you do 😉 Where can I read your essay? By the way, is that a moose in photo #4. Nice camouflage if so. Love this: “When you’re alive, you do what you can. That’s the duty, that’s the privilege of the living.” I need to stamp it on my head. Thanks, Marie. And yes, that is a moose in the picture behind the trees. I had forgotten all about that, even though that was the reason I took the pic to begin with. Funny how that happens, how seeing moose becomes so commonplace that I forget to even mention it. But it was a pretty calm moose, didn’t seem to care that we were there. Mostly it just seemed really hungry for green things to eat, after the long winter. P.S. I also love, love, love that quote. It’s kind of my motto. Congratulations on the winning essay. That’s wonderful. Glad it gave you the spark you needed. And I agree, that’s a great quote. As for your pictures, they’re stunning! Thanks, Carrie. 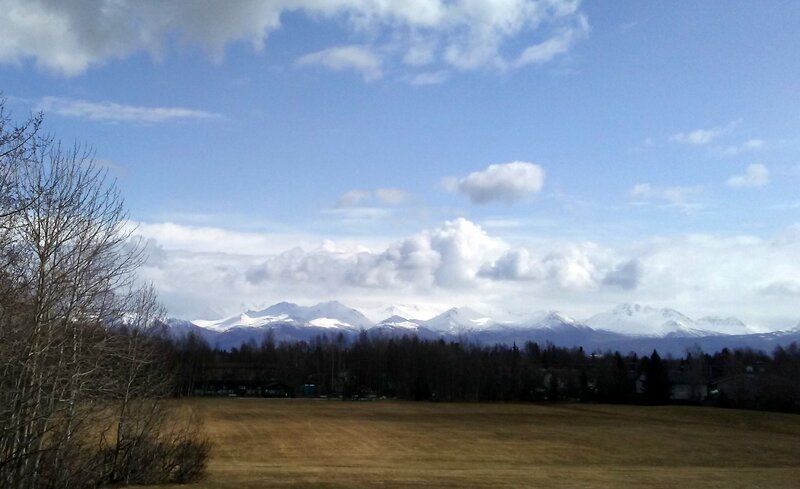 The picture are stunning and Alaska is stunning but oh, how I wish that the sun would shine a wee bit more. Cloudy days are moody and picturesque (I can’t believe I spelled picturesque right without the spellcheck, yay for me!) but can really bring me down after, like, three weeks. But it looks as if the sun is trying to peek out right now. Will have to run outside, hold my face up to the sky and soak it in before it leaves again. Cheers and hope your week is starting out well. I’d feel the same way. I crave sunlight. We’ve been having a string of cloudy days and rain in Ohio, and my vitamin D is working overtime. Very good news on the prize winning essay. Lovely validation just when you needed it! And thanks for the quote. I needed that. Haven’t written a sentence in a couple of months – other than blog comments. Thanks, Susanne! And yes, the quote is lovely, and so true. But hey, you’re writing. Blog comments count, don’t they? I read, and this is mind boggling, that some desperate writers actually count their comments as publication credits on cover letters and resumes. So if they, like, comment on the New York Times website, they’ll list NYT as a writing credit. Sneaky, no? But I get you about not writing. It’s tough. And it seems that the longer you don’t write, the harder it is to start again. I just experienced that a few days ago when I sat back down to write again. And I thought, well, this isn’t as hard as I thought it would be. Because in my mind, I had put up huge and unnecessary obstacles between myself and my writing. I have no idea why. I mean, no one has to see what I write if I don’t want to show them, so what’s the big deal? Yet, in my mind, it is a big deal, it’s a huge deal. Anyway, I should probably shut up now and wish you a great week and hope that your writing muse visits you soon (bearing gifts of chocolate and yummy teas). I’ll have to start commenting on NY Times articles although I don’t think I’d have the chutzpah to call it a writing credit. I know I’ll write again. It’s thinking that everything I write has to be published to be deemed worthy that’s nerve killer. Just write. Many congratulations on your prize-winning essay, Cinthia. I’m so pleased it’s given you the motivation you needed to get on with your writing. Thanks so much, Wendy. It’s odd, isn’t it, how many of us need outside confirmation when it comes to our writing. I wish I could get to a point where I believe fully and truly in myself and could write for months without any feedback and still know that I am on the right and true path. But writing brings up so many insecurities and doubts, and wrestling with them while sitting alone in front of a computer can be so, so scary. Anyway, thanks again and have a lovely and productive week, okay? You’re so right about the need for confirmation to help us rise above times of insecurity and doubt. Thanks, I have had a productive week. Hope you have a great weekend, Cinthia. Congratulations, Cinthia. Your essay sounds like a phenomenal read. Congratulations!!!! I’m so impressed! Weather’s beautiful here, by the way. Thanks so much, Luanne. Weather here still isn’t that great but fingers crossed and really, it’s hard to complain when we have almost 17 hours of daylight (I’m feeling more optimistic because I just ate chocolate, lol). Cheers and take care. P.S. It was really, really hard to leave Tucson, sigh, sigh. I’m kind of falling in love with the desert. It is such an amazing place, as you well know. I love the green summers of Michigan, New Jersey, etc. BUT it’s hard to get depressed in the sun. I would LOVE to meet up for a walk. What part of town are you in? We’re in Spenard and close to Coastal Trail but I’m up for anything. P.S. My dog can come, right? Wow, Cinthia! Congratulations on this honor! I look forward to reading the essay. Thank you for that beautiful photo of Seriously! I have been thinking about her lately, wondering how she is doing. Sending wishes for many days of sunshine and growing joy!